There can be few people who have not at least come across the story of Simba who is driven into exile after the death of his father and his epic journey to then become the King of the Pridelands. Originally an animated Disney cartoon, the multi-award winning musical first opened at Broadway’s New Amsterdam Theatre in 1997, reaching London in 1999 where it has played to packed audiences ever since. In September 2012, The Lion King begins it’s first ever UK tour, making it’s way to Manchester for an 18 week run at The Palace Theatre from December 6th. As Manchester will be the home of the tour for it’s longest run, it was also chosen to be the location for its press launch. The Comedy Store at Deansgate Locks provided an ideal, intimate setting for the launch. 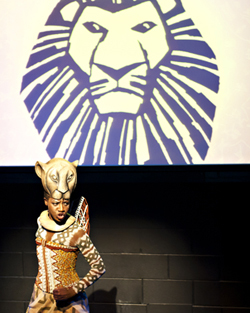 A simple set was all that was needed with the now iconic, The Lion King logo projected onto a screen central to the stage and either side of the stage sat the masks for Mufasa and Scar. Our host for the launch and providing us with a passionate and enthusiastic insight into the inception of the musical was Thomas Schumacher, the producer and president of the Disney Theatrical Group. 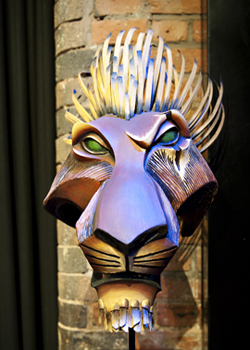 Whilst giving us a humorous potted history of the development of The Lion King as an animated feature, he very quickly made it clear that instrumental to the vision of The Lion King as a musical was the work of multi-talented Julie Taymor who is credited as director / costume designer / mask and puppet co-designer and additional lyrics. The success of Taymor’s input into the production would appear to be based on the fact that neither she nor Schumacher wanted to create a musical involving the characters in costume or with puppets where the puppeteers were hidden. Taymor strived to create a representation of the characters in which there was an allegory in which a mask or puppet form of the animal and it’s human counterpart work as one, complementing each other and enhancing the character. As Schumacher put it, the actors were to provide the spirit to the costumes. What is so impressive about the way in which this has been approached is that it doesn’t just apply to the animals but also to the fauna of the grasslands and jungle. Through video footage and interviews with Taymor we were able to see how she transferred her ideas from paper to the stage. Schumacher spoke with pride of the team effort involved in creating the overall look and feel of the musical and the influences that were instrumental in creating such a visual piece of theatre. Some influences such as the involvement of tribal art and customs were expected but I must admit that I didn’t expect to hear that seventeenth century restoration theatre provided the answer to the question of how would they portray a wildebeest stampede on stage. We were treated to several numbers from three key and fully costumed, cast members of the West End production, Rafiki, Simba and Nala. Numbers included ‘Circle of Life’, ‘Can You Feel the Love Tonight’ and a “Shadowland” written especially for the musical. The performances can only be described as excellent, given that it was midday in an unusually sunny Manchester, and whilst we were in a darkened studio in Deansgate Locks for a while we were transported to the plains of the Serrengeti. The cast members voices were excellent and the songs were sung with a real passion. We were told how ‘Can You Feel the Love Tonight’ was actually, originally dropped from the animated version of the film until Elton John found out and as Schumacher put it, he threw an ‘Elton tantrum’ until it was put back in. As the essence of the Taymor vision is ‘Can You Feel the Love Tonight’, and actually won the Oscar after being nominated, so Elton obviously knew best. It has to be said that it is very hard to do justice to the sights and sounds of the production, to which I am sure anyone who has seen the West End production (which I have not) will agree. It was good to hear that the production that is coming to Manchester is the full stage version which involves a company of 52 and not a reduced version. The producers agreed to only let it go on tour if it was the full version. You can further get an idea of the wonderful sets. Based on what I saw today when the tickets go on general release on Monday I would strongly recommend getting in line, after all, it’s a few hours of guaranteed sunshine in what is normally a very grey and wet few months in Manchester. 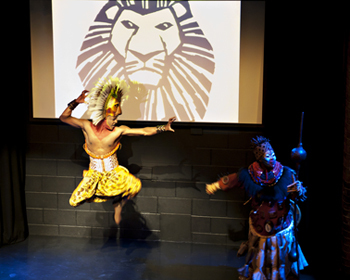 A review of the touring production from December 2012 is available by clicking on this Lion King review link. And watch the promo video below to get a sense of what it should be like.